St. Alexis was the son of Bernard Falconieri, a merchant prince of Florence. His father was one of the leaders of the Republic. His family belonged to the Guelph party, and opposed the Imperialists whenever they could consistently with their political principals. Alexis grew up in the practice of profound humility. He joined the Laudesi, a pious confraternity of the Blessed Virgin. It was here that he met the six future companions of his life of sanctity. He received an apparition of the Mother of God on August 15, 1233, as well as his companions. The seven soon afterwards founded the Order of the Servites. St. Alexis abandoned all else, and retired to La Camarzia, a house on the outskirts of the town, and then the following year to Mt. Senario. Once as a prominent citizen walking down the streets, he now walked those streets with humility begging alms for his brethren. His humility was so great, that he refused to enter the Priesthood, because he deemed himself unworthy. He lived to the great age of one hundred and ten, serving his brother Servites. His work was confined to the material needs of the various communities in which he lived. In 1252 a new Church at Cafaggio, on the edge of Florence was completed under his care. He received financial assistance from Chiarissimo Falconieri, and St. Juliana Falconieri, his niece, was trained in sanctity under his personal direction. To show the hard work and fruits of his labor, in a few years, tens of thousands of people had enrolled themselves under the banner of the Blessed Virgin Mary into the Servite Order. He died on February 17, 1310 at the age of 110. His body rests near the Church of the Annunciation, in Florence. Pope Clement XI declared Alexis worthy of veneration on December 1, 1717, along with his six companions. Pope Leo XIII canonized them all on January 15, 1725. 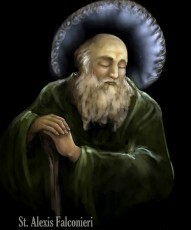 St. Alexis Falconieri was born in Florence and was a holy man who was raised in the profound practice of humility. At an early age, he was honored with an apparition of the Blessed Virgin Mary. He and six of his companions started the Servite Order, and they were dedicated to the Blessed Virgin Mary. He served the Order by getting alms and meeting their physical needs, never deeming himself worthy to become a Priest. He enrolled tens of thousands of people under the banner of the Blessed Virgin Mary into the Servite Order. He died at the age of 110.